Experience American democracy in action at this museum dedicated to the nation's most treasured document. Highlighting the importance of civics and citizenship, this interactive experience offers rotating exhibits that focus on the US Constitution and daily education programs. Known as "America's Town Hall", they also host debates and discussions throughout the year. 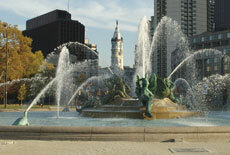 Located along Independence Mall, the center is just ten miles from our hotel. You can grab breakfast, lunch, or a light bite at the Delegates Cafe right inside the museum. Enjoy tasty soups, salads and sandwiches including the Philly cheesesteak. The dining room is open during the center's regular hours. A museum and town hall, the National Constitution Center features incredible, hands-on exhibitions that bring the Constitution to life. Experience the extraordinary story of “We the People" and leave inspired by the Constitution's amazing legacy of freedom. Enjoy interactive games and activities, art, and education programs. See the amazing mobile that celebrates Dr. Martin Luther King, Jr.'s "I Have a Dream" speech and think about your own dreams.